“I think my music is highly visually evocative”, says Niels Marthinsen. At all events his music forges contacts between the listener and the composer – to a rare degree for contemporary music. Niels Marthinsen’s works often have a direct physical appeal, and he knows how to grab the listener and keep hold. He wants to write music that doesn’t exclude anyone in advance. It must appeal to both heart and brain, and the path to both parts of the listener is short when Marthinsen is the composer. One of the reasons for this strong contact is Niels Marthinsen’s grasp of the actual composition work. He is one of the best technically grounded composers in Denmark and shies away from no technical challenge. This technical aplomb goes hand in hand with an open mind: “There are no ‘must-nots’ in my music”, he says, and this has become a kind of credo for him. He often breaches taboos. They may be taboos of sound and expression, but also more general taboos, such as mixing humour with seriousness and having a strong ambition to make an instant connection with the audience. Marthinsen views the relationship between composer and listener very seriously: “You have to allow for the listeners’ sensory apparatus, and make sure there’s something in the music that doesn’t have to be decoded first. That may sound cynical, but it isn’t. I use myself as an audience. My own musical ‘readability index’ must also go both up and down, and I myself also need the music to say “BOOM!” now and then!”. Niels Marthinsen was born in 1963 and grew up in Viborg in Jutland. He studied composition at the Royal Danish Academy of Music in Aarhus in 1982-1990. In the soloist class he was a pupil of Per Nørgård, but he has also been taught by Hans Abrahamsen, Steen Pade, Karl Aage Rasmussen and Poul Ruders. As early as 1988 he himself began teaching subjects like composition, instrumentation, theory and music history at the country’s music academies. His official debut as a composer in 1993 aroused quite a sensation. “Blood transfusion for Danish musical life” was the headline in one of the big Danish newspapers. His success brought him a flood of commissions, and since then he has only written commissioned works. That is how continuously his music has been appreciated. Besides composing and teaching, Niels Marthinsen has also organized, debated, written and administrated with great energy and effectiveness. Some artists with a talent for organization end up drowning in paperwork, and Danish music counts a sad succession of composers who have come to a halt artistically from taking on administrative duties. This is not true of Niels Marthinsen. His creativity has not been stifled by organizing a great many festivals and biennials, administrating and leading ensembles and participating in state-sponsored work on the musical front as a member of the Danish Music Council and the National Arts Foundation’s committee for classical music. In addition he has edited a book and Internet-based instructional material about contemporary Danish composition music (see www.forgrundogbaggrund.dk) and has quite deservedly been awarded some of the country’s most important music prizes: the Astrid and Aksel Agerby Music Prize, the Hakon Børresen Memorial Grant, the National Arts Foundation’s three-year working grant, the Victor Borge Music Prize and the Wilhelm Hansen Grant. An amazingly long string of works have come from Marthinsen’s pen. They are written in well nigh all forms and genres. The list includes three solo concertos, three operas, a symphony (in two versions) and a very large number of instrumental works, especially for sinfonietta or chamber ensemble. 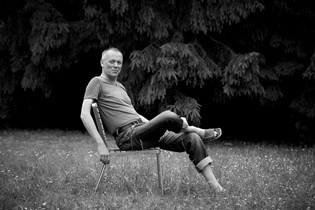 Marthinsen’s timing is an important part of his grasp of the effect of the music. Whether it’s a three-minute show-stopper or a multi-movement orchestral work, he knows when the various fireworks have to be let off. “In reality it’s like a good sitcom on TV: it isn’t the individual characters but the combination of them that makes the whole thing interesting,” he says. Another striking feature is the virtuosity that Niels Marthinsen’s music demands from the performers. A piece like A Bright Kind of High for sinfonietta is actually written for “virtuoso ensemble”. His chamber and solo works too often seek out the limits of the technically possible, but Niels Marthinsen’s goal is always to stop one degree below the maximum. Intensity from the musicians who have the high goal within reach spreads effectively to the audience. In Niels Marthinsen’s music you can also often hear that he has a sense of humour. The humour appears in many guises in his music, from the acrid to the effervescent and grotesque. The little orchestral piece Hong Kong Happy Funny Ping Pong Sing Along (2005) is funny right down to the title and is musically an example of his ready wit. The tuba solo Ex Jutlandia Obscura (1997) is a reference to his upbringing in ‘darkest Jutland’, where he first got to know of the existence of classical music when he was a high school student. The orchestral magic of his Monster Symphony (1995, revised 2004), where crazy monsters both couple and have offspring, is a playful display of the large orchestra of a kind few composers have the energy to realize. Instead he lives comfortably with and close to the overwhelming legacy of the past. This relationship goes all the way from arrangements of works by Ravel, Johan Strauss and Mozart to quotation work of an advanced kind. Schumann’s Kinderszenen appears not only in Marthinsen’s own Kinderszene (1996) for recorder and accordion, but also puts in an appearance in the orchestral piece A Bright Kind of High (1996) and in his Lyrical Pieces for piano (with a nod to Grieg at the same time). French music is given the treatment in Marthinsen’s Bolero (1996) for three drummers (as opposed to Ravel’s one) and in Rapsodie Espagnole (1992) for the surprising ensemble two accordions. In the worklist there is even an Ungarsk Rapseri (1993)(‘Hungarian Larceny’ a pun that defies adequate translation into English). .The same fearlessness applies to Marthinsen’s work with musical forms and genres. His approach to solo concertos and operas resembles the way the genres were used in their prime – when instrumental display was the centrepiece of a solo concerto, and an opera was a captivating emotional drama. Niels Marthinsen has already written three operas, and they are central to his large oeuvre. The chamber opera Love and Betrayal from 1997 is a psychodrama that takes places in Berlin after the fall of the Wall, where concepts like “love” and “betrayal” have far from lost their stature. The two-acter Maestro from 2001 is set in a retirement home for opera singers – inspired by a documentary about the real life Casa Verdi in Milan. The material in the opera generated the piano work Maestro Variations (2002), which with its 28 movements and one-hour duration is by far the longest of Marthinsen’s works apart from the operas. It is a full-length opera with a dramatic plot about jealousy, revenge and murder. The story and the title come from a very remarkable short story from the mid-nineteenth century by the Danish Golden Age poet Christian Winther, a poet who is best remembered today for his slightly vague High Romanticism, but who with The Confessional created an étude-like thriller. Marthinsen has cooked up the plot further and changed a number of the factors to stoke up the emotions even more and make the story more interesting to a present-day audience. The drama of jealousy has been given a gay twist and the setting has been moved from the clichéd Italy of the Golden Age poets to present-day Spain, and has thus provided scope for new coloristic effects. Marthinsen has the plot played out in a deliberately sensational progression that he also uses in his orchestral suite based on The Confessional; a piece he calls an “opera trailer”. In a provocative but honest way The Confessional is also in this sense a revival of the romantic opera, which after all originally corresponded to the type of gripping entertainment we know today from film and TV. “It’s important to me that the audience goes to this opera as an ordinary show. Actually, it’s just opera, so it makes no difference whether the music was written today or a hundred years ago,” says Niels Marthinsen, who likes to debate and provoke, because he can back up all his arguments.